Select and prepare appropriate food for cooking. Select cooking equipment and utensils. 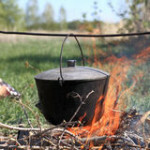 Make camp gadgets for cooking. Purify water using traditional and more recent technologies.